Surprisingly, Coriolis: The Third Horizon is just supported by two supplements. The Middle Eastern influenced Science Fiction roleplaying game, originally published in Swedish by Fria Ligan, but since published by Modiphius Entertainment following a successful Kickstarter campaign, is supported by The Dying Ship and the Coriolis Atlas Compendium. Both were funded by the Kickstarter, the first being a short scenario, the second an expansion of both the setting and the core rules—and the subject of this review. The Coriolis Atlas Compendium can roughly be divided into three sections. 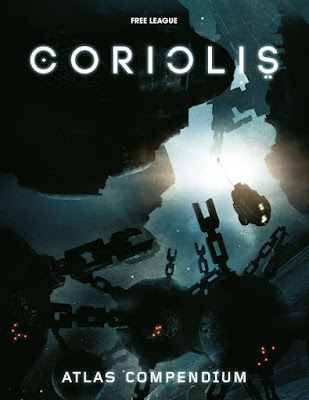 The first is an examination of the major systems of the Third Horizon—the setting for Coriolis: The Third Horizon, the second explores two aspects of the setting’s deeper history, and the third provides several sets of tables to help the Game Master run her game. Of these, the first section can be read by both the Game Master and her players, whilst the second and third are for the Game Master’s eyes only. As with both the core rule book and The Dying Ship, this supplement is beautifully illustrated with grand vistas and panoramas against the black backdrop of space to give it quite a dark look and a lot of wide margins. The first section presents details on six worlds and their systems—Algol, Mira, Dabaran, Sadaal, Zalos, and Odacon. Given the few pages devoted to each, it is no surprise that the description of each is really quite broad, never getting down to specifics. Most of the planets bear the scars of the Portal Wars and their populations are often rent by tensions between the Firstcome and the more recently arrived Zenithian Hegemony, mostly because the Zenithian Hegemony is seen to be exploiting natural resources. In places this has broken into armed conflict—of varying intensity—whilst on other worlds there is barely a whisper of dissent. Some cultural elements, such as the tradition of wearing masks on Sadaal, but on whole, these descriptions feel very light, more flavour than detail. The light treatment continues with the ‘History of the Horizon’, which explores the backstory to the First, Second, and Third Horizons—something which the Coriolis: The Third Horizon did not. It covers a thousand years in a few pages, from man’s first leaving Terra (the First Horizon) to settle the first colonies (the Second Horizon) and eventually a war between the two which would force the next wave of colonies (the Third Horizon) to isolate themselves. Knowledge of much of this has been lost to history, but it provides the Game Master with much needed context for the setting as a whole that you really wish that it could have been in the core rulebook. The same section also reveals a major secret about the identity of the Emissaries, but little more than that is given. So what exactly the ‘aliens’ are up to and what their objectives is left up to the Game Master to decide or a future supplement. Comparatively, the examination of the Portal Builders is much longer and more detailed. Primarily, this focuses not on who they were, since no-one knows and numerous theories abound, but on what they left behind in terms of ruins, such as the Monoliths of Kua—either ancient city or monument, but now settled by humanity; the Eye of Ekharan, a perfect ellipse orbiting the Amedo-B star, inaccessible due to the star’s gravity and radiation; and the Awadhi Sun Fan above the boiling planet of Denebula, whose blades shade and cool the atmosphere enough for foolhardy prospectors to mine it of its hargium gas. These add flavour without giving anything away about the setting. Not an issue for the Game Master wanting to make her own content up, but for anyone with a deeper interest in the setting, possibly a little frustrating. A good half of the supplement is dedicated to sets of table. One set is for generating worlds and systems, since not all of the thirty-six systems and their worlds are fully explored. As well as a planet’s physical characteristics, there are tables for factions, inhabitants, and hooks which greatly flavour the world. A second set is for generating missions and rather nicely, these are broken down according to type, including agents, mercenaries, explorers, pilgrims, and free traders. The mission generator is not designed to provide a full blown adventure, but rather a solid hook and two or three elements that the Game Master can develop herself. The third and last set is the shortest and probably give the longest explanation. It is for generating interesting things to happen when travelling between systems. It covers encounters on planet too, and again, serves very much as a spur for the Game Master’s imagination rather than providing her with ready made content. Physically, Coriolis Atlas Compendium is well presented, an attractive looking book with lots of good artwork. Unfortunately it feel as if there is a lot of empty space, and the fact there is, the blackness of space backdrop with occupies much of the margins. Now they are used in some places for sidebars and sideboxs of supplementary information, but often the reader is left wanting more in terms of content. What he gets instead is pretty space. One of which could have been used to list the book’s content , or indeed, its index. Unfortunately, the Coriolis Atlas Compendium is a better compendium than it is an atlas. At the very least, an atlas implies the inclusion of maps and it is very much the case that the supplement has none. Even as a compendium, there is a definite sense of the ineffable about the contents of the Coriolis Atlas Compendium, as if it is going to change the next time you open the book. Of course, the tables and their content is absolutely all there. The rest of the feels as if it is definitely not there and definitely not enough of it. The Coriolis Game Master is definitely going to want to have this supplement, as it expands upon the setting—though not too much, reveals some secrets, and provides a useful set of tables. Unfortunately, anyone wanting more detail about the setting of the Third Horizon will have to wait until the next supplement.